When I reviewed Batman #13, the first issue of “Death of the Family”, back in December, I posed the question of this arc’s place within the Dark Knight’s story hall of fame. Would it be able to stand up to the likes of The Killing Joke or Arkham Asylum: A Serious House on Serious Earth, some of the greatest works in comic history, or would it pass by leaving the Batman mythos largely unchanged? Following the conclusion of the arc in Batman #17 less than a week ago, it’s safe to say that not only is this a fantastic look at the Batman- Joker relationship, but leaves the entire Bat-family in an interesting predicament. The Joker takes centre stage for the arc, and the creative team make sure you know it. Capullo pulls no punches in creating a truly terrifying rendition of the character – his face rots before the reader’s eyes in horrifying beauty. This is some of Greg Capullo’s best work on Batman – the Joker’s face pulls and twists as events play out, and Capullo manages to portray emotions of a man who lacks many of the features that people actually need to do so. It’s twisted, disgusting and beautiful all at once. Art elsewhere is also a treat. 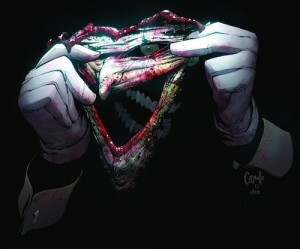 Aside from the Joker, there are many other gruesome scenes that colourist FCO Plascencia and Capullo craft excellently. Alongside the story beats, Bruce Wayne’s emotions run wild in this arc – Capulo shows anger, desperation, and sadness, seemingly with ease. I’m a huge fan of his take on an enraged Batman, and this is delivered in large doses. In the end, art wouldn’t matter if the story wasn’t up to the same standard. Thankfully Scott Snyder delivers in producing one of the most interesting takes on the Joker/Batman dynamic. Snyder places Batman on a pedestal for the Joker, showing an almost fanatical love for his nemesis, much in the same way a patriot would love their king. The Joker feels that the Bat-family drags Batman down, that his family isn’t what makes Batman – it’s the Joker that does. The Joker honestly believes he understands Batman better than anyone, and that his plan will restore his “king” to his former glory. It’s a sick and twisted love story – and just in time for Valentines Day. Snyder also creates tension with Bruce’s understanding of his nemesis as well. He holds his family at arms length, feeling that his understanding of the Joker is what can save them, and that this is something only he can handle. The way Bruce deals with his family is patriarchal, and leads to some great moments of tension. These events all come to a head in an explosive final showdown, providing one of the most memorable exchanges between these two characters. Not only does it highlight their relationship in a succinct manner, but it also provides character development that I honestly did not expect to see. Without spoiling anything, this is best exchange between the two since The Killing Joke. Hands down. When The Death of the Family finally reaches its phenomenal finale, it wont be what you expect. Snyder successfully manages to defy the expectations of what a status quo changing event can be, setting up a new world for Bruce Wayne to deal with. Snyder and Capullo’s take on the Joker is not only one of this creative team’s best stories, but one of the best Batman stories ever. This is what events in superhero comics should aspire to be.